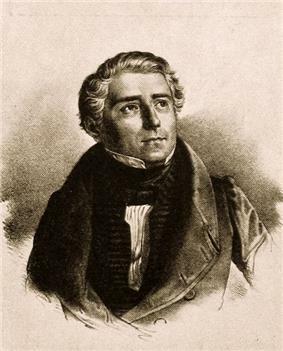 Johann Carl Gottfried Loewe (German: ; 30 November 1796 – 20 April 1869), usually called Carl Loewe (sometimes seen as Karl Loewe), was a German composer, tenor singer and conductor. In his lifetime, his songs (Lieder) were well enough known for some to call him the "Schubert of North Germany", and Hugo Wolf came to admire his work. He is less known today, but his ballads and songs, which number over 400, are occasionally performed. In 1820, he moved to Stettin in Goethe's Erlkönig in 1824 (written 1817/18) which some say rivals Schubert's far more famous version. He went on to set many other poets' works, including Friedrich Rückert, and translations of William Shakespeare and Lord Byron. ^ "The Wurlitzer Collection". Retrieved 2008-07-16. ^ "To najpewniej serce Carla Loewe! Komisja potwierdza" (in Polish). Retrieved 2012-03-24. Salmon, John (1996). The Piano Sonatas of Carl Loewe. New York: P. Lang.